I coined the concept “global security strategies” to highlight the global contexts that situate both parents’ perception of risk and their strategies for mitigating insecurities. White-collar Chinese immigrants, despite their educational achievement and economic security, widely reported an experience of blocked mobility in American workplaces. They worry that their children, despite being born and raised in the US, will still face a future shadowed by the immigrant stigma and racial inequality. They are also concerned that the holistic approach to college admission would disfavor families that lack sufficient local cultural knowledge and social networks to help with their children. Moreover, the declining US economy after the 2008-2009 financial crisis, coupled with the rise of China, renders them uneasy about the next generation’s future. The “normal” American educational standards might be “alright” for white students, but Asian students must outperform whites and compete with one other. Feeling that permissive parenting is a white privilege that minority groups cannot afford, professional immigrants adopt the security strategy of “cultivating ethnic cultural capital” by instilling values, culture, and lifestyle associated with their immigrant background into the next generation. For instance, some highlight the Chinese values of diligence, frugality, and discipline to steer their children away from what they perceive as the negative influence of American culture, such as consumer materialism, radical individualism, and excessive freedom. It is important to remember that “ethnic cultural capital” does not refer to a parcel of values and customs that newcomers bring directly from their homeland, but rather involves a dynamics process of cultural negotiation in which immigrant parents selectively mobilize their cultural heritage and sometimes mix-and-match it with values and practices in the new country. 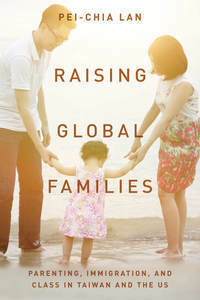 Raising Global Families» examines how ethnic Chinese parents in Taiwan and the United States negotiate cultural differences and class inequality to raise children in the contexts of globalization and immigration. Resourceful immigrants also mobilize transnational networks and resources to facilitate their children’s pursuit of success and mobility. Some parents perceive American schoolwork as “too easy” in comparison to Taiwan or China, especially in the subjects of math and science. The “normal” American educational standards might be “alright” for white students, but Asian students must outperform whites and compete with one other. Some families import learning kits for from Taiwan or China. If children cannot read Chinese well, they order English-language materials published in Singapore. Some families send their children to summer school in Taiwan or China to improve their SAT scores or Chinese language skills. The comparison between immigrants and their class peers in the country of origin demonstrates the fluidity of ethnic culture in the formation of parents’ security strategies. Although middle-class parents across the Pacific similarly mobilize their economic power and cultural sensitivity to raise global children, they develop distinct security strategies to cope with different opportunity structures. While immigrants prepare their children for the possibility of “return” migration to escape economic recession and racial discrimination in the US, middle-class parents in Taiwan seek Western ideas of childrearing and education to break from archaic traditions. They also believe that the exposure to Western education can help their children to broaden the opportunities of global mobility, especially in competition with mainland Chinese youths, who grow up in a high-pressure education system. The comparison between middle-class and working-class immigrants deconstructs the monolithic image of Asian Americans as the “model minority.” Some Chinese immigrants I interviewed work long hours in Chinese restaurants and lack language skills and cultural knowledge to navigate the American educational system. Although the public perception about Asian American achievement may create a “stereotype promise” for some Asian youth during their encounters with educators, (as noted by Jennifer Lee and Min Zhou in The Asian American Achievement Paradox) it is far more likely that working-class immigrants and their children feel pressured to be evaluated against the middle-class norm and thus feel inadequate or incompetent as parents and students. Working-class immigrants feel a stronger sense of insecurity in the shifting family dynamics, in which they find it challenging to uphold parental authority in the new country. Their security strategies therefore display a stronger aspiration to “Americanize” their styles of childrearing. They talk about hands-off parenting as an indicator of assimilation and they align children’s freedom with the American value of independence. These optimistic narratives, however, mirror their struggles to adapt to social marginalization and the reversed power dynamics of parent-child relations. The neoliberal rhetoric that turns structural barriers into personal challenges prevents parents from seeing through the power structure of racial and class inequalities. Parents’ security strategies, however, often lead to unintentional consequences. While middle-class Asian parents pressure their children to acquire immigrant toughness as an advantage in the pathway to social mobility, their validation of ethnic traits may lead to the paradox of racial otherization. For example, parents’ focus on academic subjects and selective extracurricular activities, such as the “Asian instruments” of piano and violin, reinforces stereotypes that Asian children do not pursue personal interests and lack “individuality” or “creativity,” which work to their disadvantage in the college application process. Parents strive to keep their children safe in a world that is interconnected and rapidly becoming more risky and unpredictable. Yet, their security strategies paradoxically magnify anxieties for themselves and other families. In particular, the neoliberal rhetoric that turns structural barriers into personal challenges prevents parents from seeing through the power structure of racial and class inequalities. For Asian Americans, the myth of “honorary whites” upholds the social illusion of the American dream and blames other minorities for their individual or group-based cultural failures. (see Soundtracks of Asian America: Navigating Race Through Musical Performance by Grace Wang). This not only makes it harder for Asian immigrants to identify with other racial groups who face similar barriers but also obscures socioeconomic gaps within Asian immigrants and Asian Americans. Raising Global Families investigates parenting anxieties and strategies at the intersection of cultural transformation and persistent inequality, which I hope can dismantle the essentialist representations of ethnic culture and generate empathy and solidarity across social divides.